Using “real” people as the detective in fiction seems to be growing in popularity these days. Of course, this isn’t a new phenomenon. Eleanor Roosevelt solved political mysteries in a series by son Elliott Roosevelt. Benjamin Franklin finds adventure in the humor-filled pages of Robert Lee Hall’s books, and Jane Austen turns detective in Stephanie Barron’s series. More recently, Gyles Brandreth casts Oscar Wilde and Edward Ifkovic writes Edna Ferber in the role of detective. 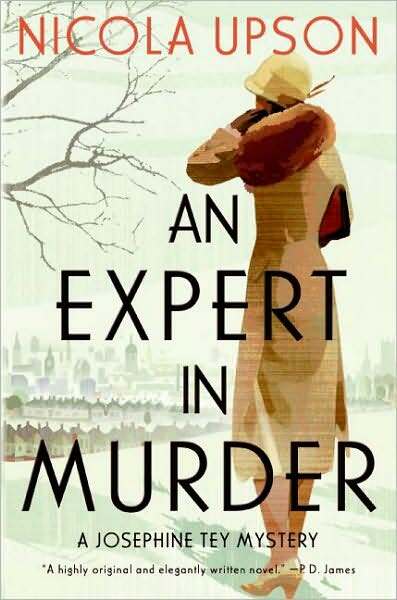 In 2008, Josephine Tey joined the pantheon of amateur sleuths in Nicola Upson’s An Expert in Murder. The pseudonym of Elizabeth Mackintosh (1896 – 1952), Tey achieved a level of renown on par with her fellow countrywomen, Agatha Christie and Dorothy Sayers, with six mystery novels featuring Scotland Yard Inspector Alan Grant. Perhaps the most influential and well-known of her novels is The Franchise Affair (1948), which focuses on King Richard III and the mystery of the princes in the tower. In An Expert in Murder, Josephine Tey is traveling to London by train for the closing of her play Richard of Bordeaux. Under the pseudonym Gordon Daviot, Mackintosh/Tey wrote several plays, including Richard of Bordeaux–one of the few produced in her lifetime–which starred a yound Sir John Gielgud. Presumably to avoid confusion, Upson only ever refers to her heroine as Jospehine Tey. Soon after Tey arrives in London, she learns that Elspeth Simmons, the young woman she met on the train, has been murdered. Elspeth was coming to London to met her boyfriend and see Tey’s play. Detective Inspector Archie Penrose, a friend upon which Tey based her character Alan Grant, is called to King’s Cross Station to investigate. Chapter Four is particularly notable in that it introduces readers to our cast of characters–think suspects–involved in the production of Tey’s play and in the murder of Elspeth Simmons. This chapter shows how well-sketched out the characters are. Some of them are based on real people, including Gielgud. Important to murder are tragic circumstances in the past that tie the characters, including Tey and Penrose, together. When a second murder strikes, it would seem someone is out for revenge and Tey herself may become a target. As a mystery novel, An Expert in Murder gets a little muddled. Tey doesn’t seem to be as active an investigator of the crime as Detective Inspector Penrose (who by the way is purely fictional according to Upson), and she seems to stumble upon the solution rather than solve it. Also, the narrative is from a subjective limited third person point of view. This presents the characters and their thoughts and feelings, focusing the lense of the story from their perspective. But is one of these perspective’s the murderers? The story here seems more focused on the characters and less so on the mystery, but it is a compelling and interesting tale. Set in 1934, Upson does a fine job of steeping her narrative and dialogue in their proper time period. Overall, an enjoyable read. To date, Upson has written three mysteries featuring Josephine Tey. I recommend a visit to the author’s site, here, for more about her books and the fact and fiction regarding Tey.